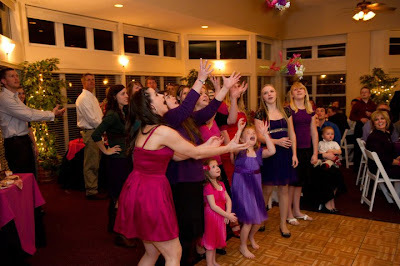 with my long, impressive resume of wedding-related experience, i can even put up with that oh-so-appealing moment when the DJ calls for all the single ladies in the room to gather up front for the infamous bouquet toss. i guess i don't mind being paraded if it'll get the job done. 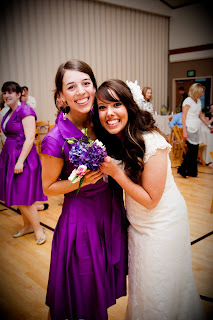 so yeah, i don't hate wedding receptions and their shenanigans in the least. yep, that's me in the back. hand on my hip. expression of bemused disdain. so what came over me? but, i like to think i'm allowed to honorably withdraw myself from here on out so other girls have their chance. For as many times as I've been a groomsman I think I should be able to withdraw from the garter toss as well. things that make me say, "gee, that's bright."